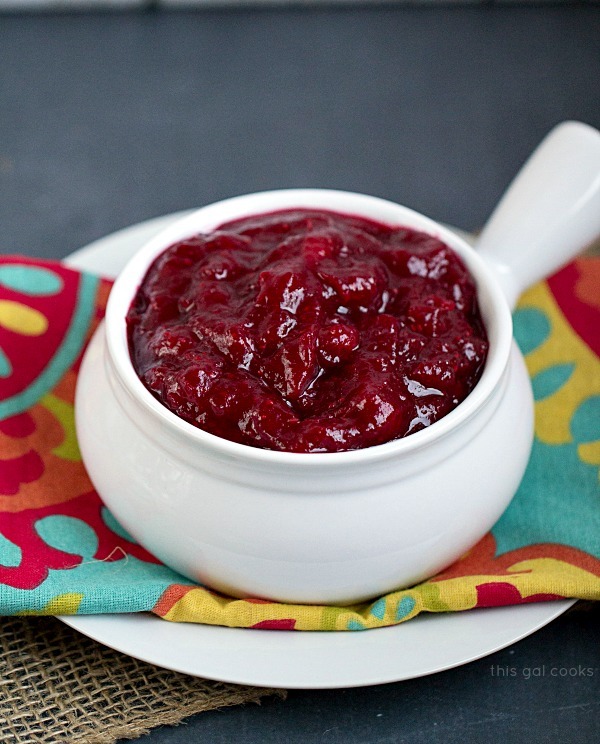 This Homemade Cranberry Sauce is super easy to make. In less than 25 minutes you can have a sweet, tart cranberry sauce that’s full on flavor but not on preservatives! I grew up on the canned jellied cranberry sauce. And I loved it. I still do. I was never a fan of the chunky cranberry sauce. Me and textures in food don’t always get along. If you missed my Classic Pecan Pie Tart recipe post, check it out. You’ll find out about my long, undying dislike of nuts contaminating baked into baked goods. Extremely long lasting dislike of nuts in baked goods. I mean, this is history, yo. Back to that canned jellied cranberry sauce. I love that stuff. When I got a little older and lived on my own, I used to bring my own can to whichever holiday dinner I was attending, just in case the hosts weren’t serving it. It was a must on my plate. It still is, to some extent. But this year for Thanksgiving, I decided to make a batch of fresh cranberry sauce. I found a recipe over on A Cozy Kitchen and decided to base my recipe off of it. 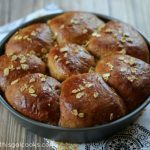 I made two minor changes to the recipe: I used honey in place of the white sugar and ground ginger in place of fresh grated ginger. I didn’t have any fresh ginger to use. I know, shame on me. But if you would have seen me the day before Thanksgiving, you would have forgiven this crime of mine. I had a baking marathon that day. And I came in first place. I was one busy gal. By the end of the day, all I wanted to do was sit on the couch with my feet propped up on the coffee table while enjoying a beer. And I did just that. Well, I didn’t prop my feet up on the coffee table but I was quite content. In a medium sauce pan, combine all of the ingredients and mix well. Cook over medium heat for about 20 minutes or until the cranberries have burst, stirring occasionally. Remove the cinnamon stick from the sauce and discard. 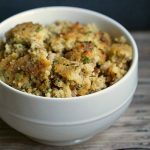 Remove from the heat and transfer to a serving dish or place in a storage container if you are serving next day. 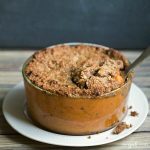 Can be made ahead and served the next day. I have a whole bag of cranberries that needs to be used! I’m thinking I should give this a try! 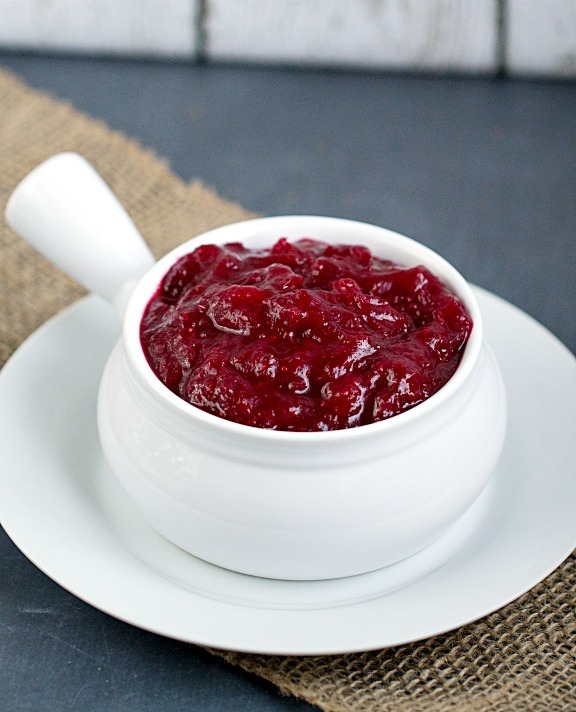 This cranberry sauce looks absolutely delicious! It looks so rich and chunky, just the way I like! The honey and brown sugar are an interesting twist. I’ll definitely have to give this recipe a go! Hi Julie – Your photo looks so bright and pretty! My hubby and I both love cranberry sauce, and homemade is the best! Thank you, Joanne! Cranberry sauce is a must have for me. I love the tartness of of it!